Packet Data Analysis (PDA) is an outstanding tool for live monitoring of signaling and traffic over IP/TDM. Packet Data Analysis (PDA) is distributed with GL’s Packet Analyzers, allowing users to monitor live IP/TDM networks including capture, analysis, and reporting of every call in detail. Supported protocols include SIP, SIP ED137B, RTP, MEGACO, MGCP, H.323, Skinny (SCCP), RANAP (UMTS IuCS), PPP, GSM A, ISDN, SS7, MAP, CAP, INAP, GSM, and CAS. GL’s Packet Analyzers can capture IP packets over different transmission lines, including IP, T1, E1, T3, E3, and OC-3 STM-1 / OC-12 STM-4. 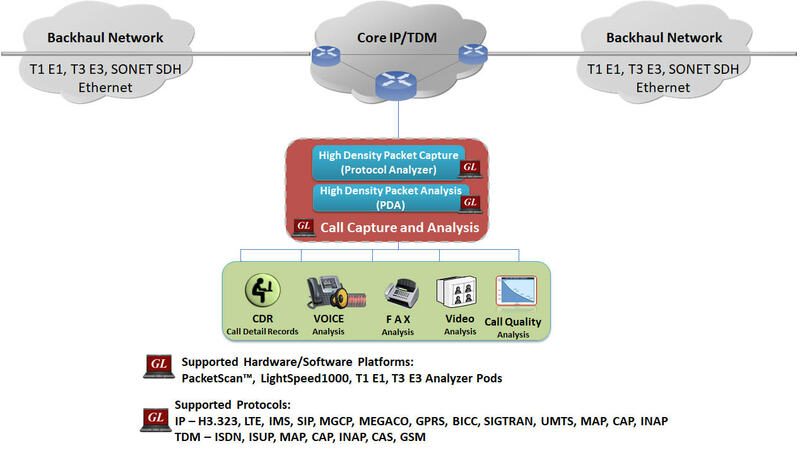 PDA then processes the captured packets, identifies, and segregates calls based on signaling and traffic parameters. Packet Data Analyzer (PDA) is a real-time IP, TDM, and VoIP analysis tool in PacketScan™, SS7, ISDN, GSM, CAS, and MLPPP Analyzer (T1 E1, T3 E3, OC-3 STM-1 / OC-12 STM-4) that non-intrusively captures and monitors live IP, TDM, VoIP, and IP based Video traffic. Segregates, captures, and collects statistics on VoIP/TDM calls. PDA is an outstanding tool for live monitoring of VoIP/TDM traffic. It can also monitor, report, analyze, and capture calls for infinite time, limited only by the finite space of your hard disk or network hard drive. Detailed call statistics such as packet loss, gap, jitter, delay, RTP performance statistics, R-factor & MOS scores, and unparalleled voice band statistics can be monitored simultaneously. Sophisticated filters permit zooming and recording of specific calls of interest. All or filtered traffic can be recorded into a trace file. Users can listen/record audio and video data of a session VoIP calls in real-time; perform power, frequency, spectral, tone and digit analysis, and video analysis with ease and precision; get an exact picture of QOS (quality of the service) and the technical adherence of the system under test (adherence to the protocols specified by the standardizing authority). Summary View (Call Quality Matrix) displays complete summary of VoIP/TDM call information in graphical format along with a summary of alerts. Detail View (Diagnostic View) displays packet by packet statistics for particular call information in tabular format. 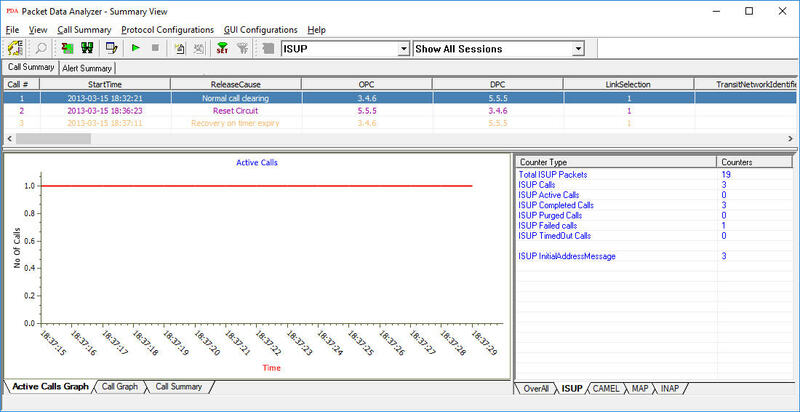 This allows the user to have a detail look at the two (or one) RTP sessions that are part of a single call. This distinction assists in any comparisons that are to be made between the two sessions. Here each frame of the selected session is dissected and its contents are displayed in a tabular form for easier viewing and comparisons. Vital aspects from the RTP frame needed for close analysis are included provides in tabular and graphical formats. A host of counters gives the user an instantaneous snapshot of the VoIP/TDM traffic on the network. Registration Summary View (IP) displays statistics and status of the SIP registration process, an active registration graph, and registration trace graph of each SIP registration. Full RTP Analysis with audio capture/playback supported for all common codecs. Pictorial representation of the statistics including ladder diagrams for the calls of various protocols. Ability to export and analyze call detail records of completed calls using advanced Excel® addin. These reports can be further analyzed using custom Excel® addin. T.38 Analysis - The application has the call graph and T.38 ladder diagram display. User can decode T.38 frames received over VoIP calls and can have ladder diagram for T.38 traffic flow, reassemble the fragmented data and to identify the T.30 message from it. Displays summary of signaling, audio, and video parameters such as Source/Destination Video Channels, Media Type, SSRC, Average Delay/Gap, Packet Counts, Media Delivery Index (MDI- (Delay Factor : Media Loss Rate)), and Frame Rate are calculated and displayed for all video calls. Supports capturing of voice, digits, tones and FAX etc to *.PCM file format. Filter captures based on protocol parameters followed by a set of actions for the completed IP/TDM calls. For example, in case of ISUP protocol filtur capture parameters such as OPC, DPC or CIC and the set of actions are save call, send mail, trigger alarm notification etc for the completed calls. Registration statistics and trace messages depicted graphically. Provides the registration summary of each SIP registration including the user agent, registrar, status, registered time, expiry time, time to live, remaining time, and Registration Request Delay (RRD). R factors/MOS supported for more audio and video codecs. Supports saving the selected calls from traffic analyzer into *.HDL, *.PCAP, or *.PCAPNG formats. Packet Data Analysis (PDA) is an outstanding tool for live monitoring of signaling and traffic over TDM. Packet Data Analysis (PDA) is distributed with GL's CAS, ISDN, SS7, UMTS, and GSM protocol analyzer. Allowing users to monitor live TDM networks including capture, analysis, and reporting of every call-in detail. Supported protocols include CAS, ISDN, ISUP, CAMEL, MAP, INAP, and GSM. GL's Packet Analyzers can capture TDM traffic over different transmission lines, including T1, E1, T3, E3, and OC-3 STM-1 / OC-12 STM-4. PDA then processes the captured frames, identifies, and segregates calls based on signaling parameters to generate reports. Packet Data Analyzer (PDA) records bi-directional traffic of caller and callee into two PCM files on the bearer channels associated to Call. Bearer channels can be extracted from the signaling information which can be mapped to Data Link Group configuration and it varies for different protocols. 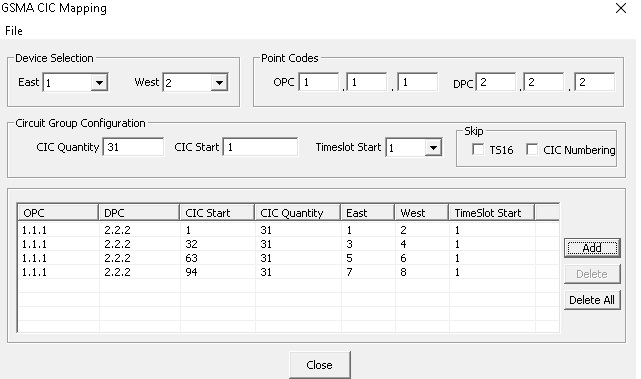 For example, ISDN calls gives channel number, ISUP calls gives Circuit Identity Code (CIC), user needs to pre-configure datalink group mapping for PDA to record traffic. PDA acts as a client and connects to WCS server to record PCM files. Using the bearer channel extracted from signaling information PDA will scan data link groups for mapping and records the Traffic. Screenshots of Data Link Groups for ISDN, ISUP, CAS, GSMA protocols. 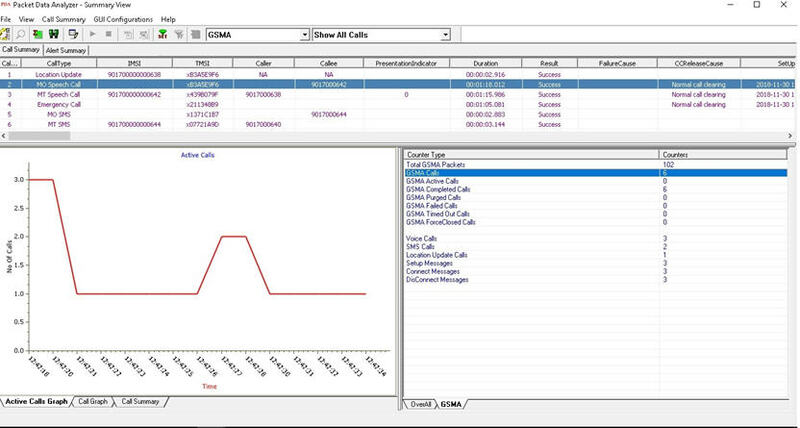 Graphs are provided in The PDA Summary and Detail Views for key values to give a pictorial representation of the statistics, thereby allowing the user to monitor the network with ease; following graphs are displayed in PDA for TDM – Active Calls Graph and Call Graph. Call Graph displays the message sequence of captured CAMEL, MAP, INAP, ISUP, ISDN, and CAS calls. For TDM protocols includes CAS, ISDN, SS7 information such as the Timeslot, Caller, Callee, and Release Cause. Message sequence pictorially display all the messages exchanged in a session with relative time stamp of the frame (from the call start time) and frame numbers. Frame number is provided to identify the message to the corresponding frame in Packet Data Analyzer. For example, in the following figure, the ISDN call capture between two Source (#1) and Destination (#2) devices shows that, the call is placed from Device #1 to the Device #2. User can also view the decoded message by selecting a message displayed in the graph. Call Summary displays signaling parameters for each call. Signaling parameters include Caller & Callee id information, call duration, call status, call-initiated time, call established time, call stop time, call duration, call terminator, call failure reason, and total signalling frames. Allows to filter calls based on CAS, ISDN and SS7 protocol parameters followed by a set of actions for the completed calls. The actions include saving a call to a file, recording the audio to a file, sending an email, generating an alert summary, creating Call Detail Records, and viewing custom calls in summary view, and extracting fax images from the captured calls in TIFF format. Alert Summary - Generates alerts when particular vital parameters go beyond a specified value. The Alert Summary provides an active list of the alerts that have occurred during the test session. Supports Save Call feature to save successful and failed calls in either in GL’s proprietary *.HDL file format, Ethereal *.PCAP file format, or *.PCAPNG file format. This allows the users to get data from real-time traffic locations for detailed analysis of a flawed call. GL's Network Monitoring System uses probes with PDA to prepare and send detail packet statistics, call quality measurements, and Call Data Records (CDRs) to a centralized database. Later these records can be viewed remotely using a web client with graphical and historical reports. For more details, click Packet Monitoring and Surveillance System.